In this article, we will explain elements and functionality of the Query Builder for Google Analytics through an example. Our goal is to filter organic search values by country. We chose "New users / organic by country" for our query name. Metric (required) : Select a metric from your connected google analytics data source (the aggregated statistics for user activity to your site), such as users, new users, clicks or pageviews. A metric can be used in combination with other dimensions or metrics, but only where valid combinations apply for that metric. 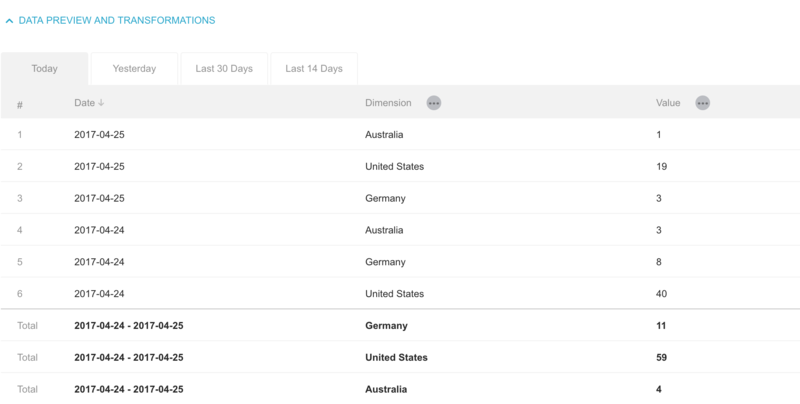 Dimensions (optional) : The dimensions parameter breaks down metrics by common criteria, such as by browser or country (like in our example). When dimensions are requested, values are segmented by dimension value. If a query has no dimensions parameter, the returned metrics will provide aggregate values for the requested date range, such as overall pageviews or total bounces. Date range (required) : To display your data the way you like, you will need to choose a date range. Just click on the "Date range" field. Selected intervals will be enabled for a new metric. Compare With (optional) : Select a date range to compare your previously selected interval to. This date range will be used for "previous line" on line and bar charts, and for calculating change %. Options are: None, Previous interval and Same interval last year. Segment (optional) : A segment is a subset of your Analytics data. For example, out of your entire set of users, one segment might be users from a particular country or city. Another segment might be users who purchase a particular line of products or who visit your page and came from organic search sources, as in our example. Read more about building new segments in Google Analytics. Metric Sort Order: Sort results by Ascending or Descending. Metrics, where lower values are better (e.g. Bounce Rate) the sort order needs to be set to Ascending. There's a limit of how many rows (dimensions) we can pull from Google Analytics, per request (currently 2000). By default the sorting is set to "Descending", which means that if you have more than 2000 rows you won't be able to see the ones above 2000. For Metrics like Bounce Rate the lowest values are the best performing ones, but wouldn't be pulled because of the limitation. For Metrics where the lowest values are best performing it's necessary to change the sorting to "Ascending". What is Google Analytics 100 second Query Builder error? What is the significance of the Metric Sort Order field in the Google Analytics Query Builder?